Hi-Tech Pharmaceuticals Musclevite™ is a comprehensive preparation supporting the health and well-being of active people. The advanced formula of vitamins and minerals has been supplemented with substances supporting exercise efficiency, as well as the metabolism of athletes. This supplement is an excellent solution for all those who want to provide their body with comprehensive care and ensure optimal regeneration. Musclevit™ offers increased amounts of all the substances necessary for physically active people.. In addition, the manufacturer made sure that the product contains a selection of only most-advanced forms of vitamins, minerals and additional ingredients to achieve the maximum high bioavailability of ingredients. The antioxidants contained in the preparation, namely vitamin A, vitamin C and vitamin E, help to reduce the level of oxidative stress while strengthening the body's immunity. High doses of vitamin D and vitamin K support skeletal system, regulate calcium metabolism and ensure a good condition of the cardiovascular system. Technologically advanced forms of B vitamins (e.g. methylcobalamin, P-5-P) support the metabolic processes of the body, show many benefits for the nervous and cardiovascular systems, and optimize the processes of hematopoiesis. The supplement contains substantial doses of minerals that are responsible for numerous functions throughout the body. They are extremely valuable because nowadays it is much more difficult to find food rich in these ingredients, which means that many people may struggle with their deficiency. Therefore, It is worth to supplement a diet with a preparation containing a complex of micro- and macro elements. Calcium, potassium and phosphorus derived from the patented potassium calcium phosphate citrate – Calci-K® -- are the most important minerals when it comes to bone health; they also have a significant impact on neurotransmission. The remaining minerals have been contained in the preparation in the form of chelates or Albion® amino acid complexes – known for the highest possible quality and assimilation. Magnesium supports the proper bone structure, and also allows the synthesis of key enzymes in a variety of metabolic reactions. Iodine is a microelement that is responsible for the production of thyroid hormones, hence it can affect the metabolic rate and well-being. High levels of these hormones help to maintain a defined, athletic figure. Zinc is a component of many enzymes, thanks to which it participates in numerous metabolic reactions. The appropriate level of zinc has a positive effect on the complexion and it is also extremely important for maintaining good immunity. Selenium, in turn, though it rarely occurs in natural products, it supports thyroid function. In addition, selenium deficiency is associated with an increased risk of cancer, hence it can be an element of cancer prevention. Copper counteracts the growth of bacteria and free radicals and supports the condition of the skin and joints. Manganese promotes the proper structure of joints and allows the synthesis of enzymes. It is also a key factor for the proper absorption of vitamins. Chromium is an extremely interesting element due to its influence on the metabolism of energy substrates of the organism. The appropriate concentration of chromium is an important factor in maintaining the normal insulin response and cell sensitivity to this hormone. What's more, chromium may reduce the appetite for sweets. Boron is a trace element that is often underestimated. It is extremely important for maintaining the correct structure of calcium in the bones, which results from the better use of calcium, phosphorus and vitamin D by the body. Interestingly, it may also affect motor coordination. Beta-alanine, in the proprietary form – Beta-PureTM, is great support for very active people because it allows a rapid increase in endurance and it minimizes post-workout soreness. Beta-alanine is an organic chemical compound from the group of endogenous amino acids. It promotes the synthesis of the β-alanyl-L-histidine dipeptide, i.e. carnosine. This substance acts as a pH buffer in the muscles, counteracting sharp falls in acidity. Its increased level allows the neutralization of a large amount of lactic acid, which is produced during exercise. This results in reduced pain after and during a workout, thus enabling the performance of more repetitions. In addition, carnosine is a powerful antioxidant, thanks to which it reduces the occurrence of inflammation, which further limits post-workout soreness and carries a number of other pro-health effects. L-carnitine L-tartrate in the patented form of CarniPureTM provides L-carnitine, an amino acid with extraordinary functions in the body. This substance optimizes obtaining energy from fatty acids, both those from the diet and from the body cells. This is due to the function of this substance – it allows the penetration of long-chain fatty acids into the interior of the mitochondria, which is a kind of a "power plant" of a cell and this is also a place where energy generation occurs. In addition, L-carnitine increases the insulin sensitivity of cells, further promoting the synthesis of steroid and thyroid hormones. Thus, it can improve muscle mass gains, speed up the metabolism and improve well-being. 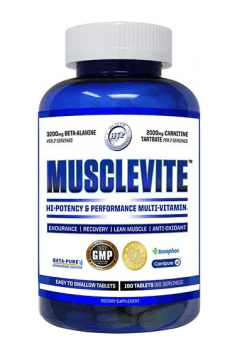 In summary, Hi-Tech Pharmaceuticals Musclevite ™ is a vitamin and mineral preparation with rich composition and high doses of ingredients, which was additionally supplemented with substances supporting physical development. Already 3 tablets of this preparation are enough for an active person to supplement their daily diet with all essential nutrients. Take 1 serving (3 tablets) up to twice daily with food. In order to obtain the maximum bioavailability of ingredients contained in the supplement, it should be administered during a meal. Due to the presence of chromium and L-carnitine L-tartrate, the preparation is worth to be implemented during weight reduction. This preparation works particularly well in periods of high physical and mental load or during the autumn-winter period. The preparation can be successfully used by both men and women, however, due to the high doses used, women should be careful when using, avoiding exceeding the recommended doses. Microcrystalline Cellulose, Stearic Acid, Croscarmellose Sodium, Polyvinyl Alcohol, Titanium Dioxide, Polyethylene Glycol, Talc, Copovidone, Magnesium Stearate, Silica, Hydroxypropyl Cellulose. Zinc glycinate - a highly assimilable form of zinc in the organic form of amino acid chelate, combined with the structurally simplest chemical amino acid - glycine. It was proven in the studies that zinc demonstrates better absorption and bioavailability in the form of glycinate in comparison to non-organic forms, which indicates better utilization of this form by the organism. Zinc glycinate is characterized by high stability, thanks to which it is stable in changeable pH of the digestive system and low molecular mass, enabling easy permeation of substances from intestines to blood. The absorption of zinc in the form of chelate, contrary to other forms of this element, is not limited by the ingredients present in food, i.a. phytates.